TWO MEN KILLED. THIRD SERIOUSLY INJURED. which is in a fairly advanced stage, and caused havoc in a shell squad which was working amidships on the huge liner underneath the giant gantry, which is such a conspicuous object at Queen’s Island. A few minutes alter five o’clock the squad was busily at work under the supervision of a plater with an apprentice, a holder up, and two helpers. 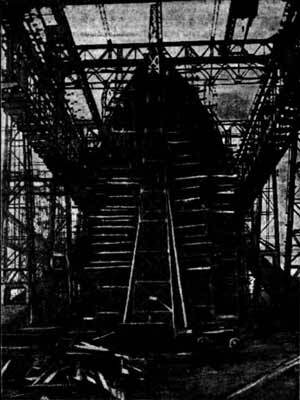 A ten-ton crane on the gantry was hoisting five plates for the bulkhead of the ship when, without the slightest warning, several of the plates slipped from the sling and fell below right on to the gang of men working on a staging. One of the helpers, named Robert Kilpatrick, was struck right the back of the skull by a plate which fell sideways, and literally clove his head in two. The second helper, whose name was Lynas, was also struck by the plates, and hurled to the ground, thirty feet below, being killed on the spot. The holder-up, named Arthur M’Quoid, was also involved in the smash, and knocked on to a staging underneath, as was also the unfortunate man, Kilpatrick. By what seemed a miracle the plater and the apprentice got clear, and escaped uninjured. The plates were what are known as "twenties," and the combined weight of the load in the sling amounted to five or six tons. They are by no means the largest size of plates, hence the fact that so many were being lifted at once by the crane, which is one of several of various lifting power on the huge gantry. The crash of the falling plates alarmed the yard, and men came running at once to the spot from all parts of the ship. Lynas was carried to the store, and as soon possible M'Qaoid was got down from the staging on to which had been thrown. was shockingly injured, one of his legs having been shattered, while his back was also badly hurt. So terrible was the crushing of the limb that the bone was left protruding above the knee, while the knee itself was smashed. The city ambulances were telephoned for, and on the arrival of the firemen from the Central Station, M'Quoid and Lynas were carried to the Royal Victoria Hospital, where they were received by Drs. Houston and Steven. A glance sufficed to show that Lynas was beyond human aid, and his remains were reverently carried to the mortuary by the firemen from the extern department. He was a man of fine physique, weighing about 12 stone, and the injuries which had received were very extensive. Five minutes later, and just as the factory horns were blowing six o’clock, the Whitla Street ambulance dashed up with the body of young Kilpatrick, which was removed at once to the reception-room, where Dr. Houston pronounced life extinct. The scene in the room was a pathetic one. as the white-coated surgeon stooped down to examine and feel the pulse, which, unfortunately, had ceased to beat more than half an hour previously. Having resorted to the usual tests, the doctor mournfully shook his head, and with an expression of sorrow from the resident pupils who had come in to render any aid they could, the firemen carried the stretcher to the mortuary, and deposited the remains beside those Lynas. Accompanying Kilpatrick to the hospital was one of his fellow-workers who had helped to carry him from the staging through the frames and down the ladder to the store. He had come away without his coat, and was saddened at the loss of his workmates, both whom were very fine young fellows. 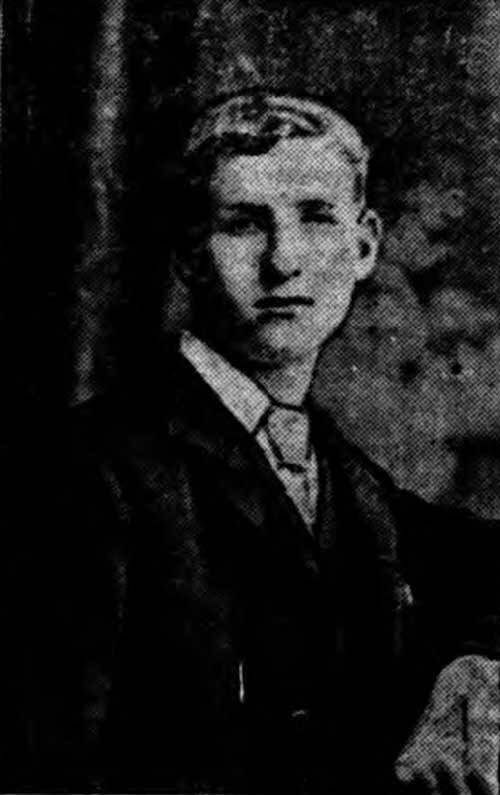 Kilpatrick’s death had been instantaneous. The wound on the back of the skull showed that, and it was also noticed that the plate which had struck him down had torn the shirt off his back. Robert Kilpatrick (22), 251 Cupar Street, plater's helper. John Lynas (27), 36 Banbury Street, holder-on. Arthur M'Quoid (20), Mersey Street, plater's helper, compound fracture to knee, injuries to back and shock. The case of M'Quiod was exceedingly critical, and he was attended to at once by the resident staff. Amputation of the leg may have to be resorted to, and it is feared that the injuries will prove fatal. He was accompanied to the hospital by a brother, who lives in Jocelyn Avenue, and who was working in the yard at the time of the accident. The case of Lynas was a particularly sad one. He had just started work that morning at the Island after a period of unemployment, and his first day was doomed to be his last. It was impossible to ascertain his address at the time of his arrival at the hospital, but shortly afterwards his father hurried up Grosvener Street from his work, and was shocked to find that is was his son who had lost his life. He identified the remains as those of his boy, and after leaving his address with the officials, left for home in a greatly distressed condition. Kilpatrick recently left the house of his father in Mountjoy Street, and went to reside at 251 Cupar Street. He was only about 23 years of age. and was a plater's helper's boy. He left home as usual this morning in the best of spirits, and the news of his tragic end has cast gloom over the immediate neighbourhood, for it appears that he was very popular, not only with his workmates, but also with all with whom he was acquainted. He leaves a widow and young child, both of whom have for some time past been from home, and to whom the terrible news was communicated by wire immediately it became known. A shipyard worker who witnessed the accident, said that it occurred instantaneously. At first he thought the sling had broken and that all the plates had come down, but as far as he could learn afterwards the sling did not break, but some of the plates slipped out. He saw one of the men, whom he found to be Lynas, fall to the ground, while he himself ran up the ladder to attend to Kilpatrick, who was dead when he got to him. He had fallen from the staging on which he was working to staging beneath, the blow of a plate having apparently killed him on the spot. It was a work of great difficulty, said, getting him down to the ground, but the task was accomplished as soon as possible, and he was hurried away to hospital. He could not tell how the plater and the apprentice escaped, but they got clear very luckily. The staging used at the Olympic is of a special nature, the supports being made of steel owing to the great height of the vessel. The plates which collapsed were for a bulkhead of the ship, and being smaller than those used the shell of the vessel it was feasible to lift five or six of them at once. The large plates are only lifted one at a time. The accident is the most serious which has happened at the Queen’s Island since the disaster on the new Hamburg-America liner Arcadia ten years ago. On that occasion staging broke and firemen tell from the tank top of the vessel, four of them being killed and the other seriously injured. The deaths of Lynas and Kilpatrick were reported to the Mountpottinger police, and the coroner will be notified on Wednesday morning, with a view to opening the inquest. We are informed on inquiry at the Royal Hospital shortly before noon that M'Quoid. although still in a critical state, was progressing as favourably as could be expected, and that amputation of the leg had not been made.